Creating your own custom needlepoint flask is easy. You can upload your photo right to this page. You are given the ability to preview the look of your flask immediately. If your flask does not look quite right, send us an email of the photo and we will make sure that it is customized to your specifications. GRAPHIC DESIGNERS - Learn to create the needlepoint flask of your dreams by watching our instructional video. Afterwards, you can upload your design directly to this page and see how it turned out. If you do not fancy yourself a designer, you can opt to order a Life Treasures Custom Needlepoint Flask and we will handle the design process for you. Once you place the order, we will have a design preview ready within 3 - 5 business days. We will email you a draft of your design and you will have a chance to review and make adjustments if needed. We will not start stitching until you are completely happy with your belt’s appearance. 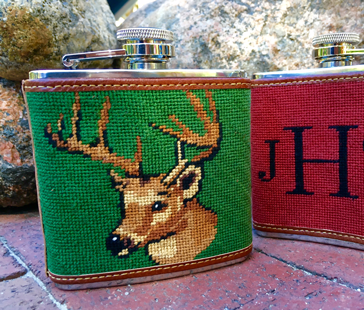 Our flasks are needlepointed by hand and finished using real leather and around a 5 oz stainless steel flask. We have a 100% satisfaction guarantee on the design and quality of our work. Please be sure you send us any important details about colors that will be helpful. The color you see on the computer screen is very close to real, but digital colors do change from computer screen to computer screen.